Activist Lori Berenson Finally Allowed to Return to U.S.
After 20 years, activist Lori Berenson, convicted of aiding leftist rebels in Peru, is finally returning home to New York. 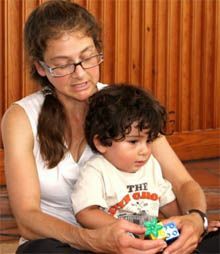 The 46-year-old has been living quietly in Lima with her 6-year-old son since her 2010 parole because she was barred from leaving the country until her 20-year sentence lapsed. Berenson told The Associated Press that occurred on Sunday. She was initially convicted of treason in 1996 by a court of hooded military judges and sent for nearly three years to a frigid prison at 12,700 feet (3,870 meters) altitude, where her health suffered. As required by Peru, Lori Berenson has returned to finish her parole. Her visit to the U.S. to see her family for the holidays will likely be her last until the end of her parole in 2015. Angry about the court approval of her travel, the Peru legislature this week passed a bill preventing anyone convicted of terrorism from leaving the country while on parole. Lori Berenson and Son Arrive in U.S.
After three days of bureaucratic wrangling, including being prevented at the airport from boarding a flight, Lori Berenson arrived in Newark, NJ this morning on a flight from Peru. It is Lori's first time home since her arrest in 1995. She must return to Peru to finish her parole on January 11. Here's a timeline of events in her case. Peru Prevents Lori Berenson's Departure to U.S.
Bump and Update: Lori Berenson and her son were prevented from leaving Peru at the airport. The prosecutor says he filed a motion to nullify her travel order on the grounds that parolees may not leave Peru. He didn't know if it had been granted. (A three judge panel had granted her permission, overruling a lower court which had denied it in October.) Berenson says Peruvian airport officials are falsely stating she arrived late. I'm on a short break from court, but I just saw that a Peruvian court of appeals has ordered Lori Berenson back to prison. I'll check the details later but my initial reaction is how awful and wrong-headed. American Lori Berenson has finally been freed from prison in Peru, after serving 15 years of a 20 year sentence. Berenson has served 15 years of a 20-year sentence for aiding Peruvian rebels in a 1995 plot to overthrow Peru's congress. Her release is conditional, meaning she's on parole. So she can't leave the country right away. According to the FreeLori website, maintained by her family, she and her year old son Salvador, whom she had in prison, will be moving to an apartment in Lima. Here's an interview with Lori from 2008, describing her arrest and life in prison. Lori's parents, Mark and Rhoda Berenson, worked tirelessly all these years to free Lori. They never gave up. What wonderful news, so long overdue, for all of them. In 2004, American Lori Berenson lost her last appeal of her 20 year sentence (earlier reduced from life) in Peru. This week she had a baby boy. The father is Anibal Apari, a lawyer in Lima who also served time as a member of the Tupac Amaru Revelutionary Movement. They met in jail and have been married since 2003. Lori is now 39. As horrible as conditions must be in a Peruvian jail, at least they allow her to keep and raise her baby until he's 3 years old. She'll be eligible for parole in 2010, and if she is granted release, she'll be deported to the U.S. where her father is looking forward to helping raise the baby. "I'm just ecstatic. This child will likely be my only grandchild, and I'm going to spoil him if I can," her father, Mark Berenson, a former college professor, told The Associated Press.